Tarrah Young was the youth and local food coordinator at EcoSource, an environmental organization in the Mississauga area that leads programs focused on local food, youth action and education. EcoSource has partnered with Taste of Nature to produce the Go Ontario! bar, a nutritious granola bar using 100 percent Ontario grown ingredients. A portion of the sales is donated to EcoSource to help fund their healthy eating school programs. The bars can also be used as a fundraiser for environmental and student groups. Young has noted that although the local food movement seems to be gaining momentum, there has been a breakdown in the local food-processing industry; local food processing facilities have declined and there is an increasing tendency amoung consumers to buy prepared food over fresh. Specifically, Young noticed that she could not find a single healthy snack made from local ingredients. One of the listed EcoSource mandates is to educate kids about the value of eating local food that does not have to travel thousands of kilometres to fill their lunch bags. The Go Ontario! bar is a snack bar that is more environmentally sound because of this. The bar has been distributed to Peel region schools as part of their snack program and new curriculum points have been introduced to educate students about the importance of the local food system. EcoSource’s staff work in communities and schools throughout the Peel Region to deliver interactive environmental and food system learning experiences to youth. The bars are available at health food stores across the GTA. With the help of the New Farms Incubator Program at FarmStart, Tarrah Young now owns and operates Green Being Farm, a flourishing 20-hectare farm specializing in the production of winter vegetables and pastured/grassfed poultry, pork, beef and lamb. 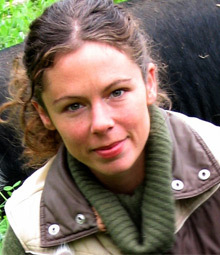 Check out her FarmStart profile.